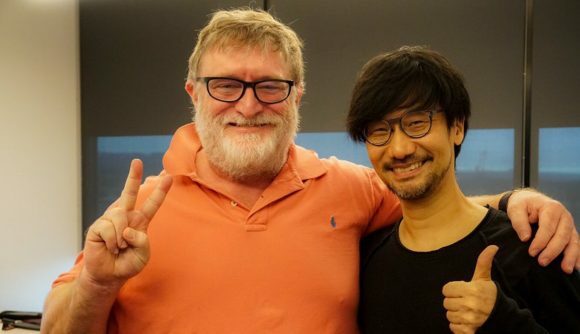 Hideo Kojima and Gabe Newell are responsible for the two biggest missing threes in videogames: Half-Life 3 and chapter three of Metal Gear Solid V. That’s where the similarities would seem to end, but now the two have met in person, and Kojima’s even provided photographic evidence of his visit to the Valve offices. “Visited Valve,” Kojima tweets. “Took pic with Gabe.“ That pic sees Kojima giving the thumbs-up and Newell showing a peace sign, as appropriate to the post-Peace Walker lore of Metal Gear. One thumb plus two fingers? That’s a three. Kojima also provided two other photos, showing the big valve and Atlas robot at the company’s office. That makes three photos. That’s all the evidence anyone needs to say Half-Life 3 or chapter three confirmed – at least jokingly. In realistic terms, Kojima has been meeting with game developers and entertainment companies while posting selfies on Twitter ever since departing Konami, and this is just another stop on that world tour. In the past few days alone Kojima has stopped by Pixar and Infamous developer Sucker Punch. It is notable, though, that many of Kojima’s public game studio tours have been at studios adjacent to Sony, the company which is publishing Death Stranding. Kojima meeting with the top distributors of PC games is something sure to raise some eyebrows, though we’re a long way from anything resembling confirmation of new Kojima titles as upcoming PC games. In the meantime, though, enjoy the adorable photo of Hideo and Gabe hanging out, and come up with your best rambling explanations of why this means the true ending of Metal Gear Solid V is Half-Life 3.